Going for a high-end Bluetooth speaker might sound counter-intuitive for most, but there are people who simply demand a certain level of sound quality wherever they go. For an individual who belongs to this group, pure mobility is not enough. Some probably won’t be content even with a $100 Bluetooth speaker. Today we have prepared some of the high-end Bluetooth speakers for you to check out. The models we went with offer great performance but also great aesthetics as well. Needless to say, these are going to be some of the best Bluetooth speakers on the market. A simple yet functional design with plenty of style. Great set of drivers which ensure great sound. Massive range that spans from lows to trebles. Voice prompt makes it easy to use. The battery could have been better. Whenever you start looking into higher end audio, chances are that you will run into Bose one way or another. This brand has been involved in making some of the best wireless speakers on the market, which is exactly why we want to show you one of their creations. 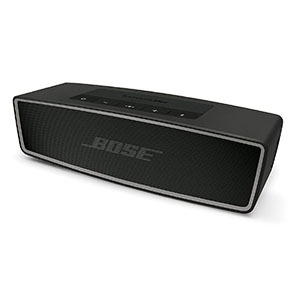 Bose SoundLink Mini Bluetooth Speaker II is definitely worth checking out. One of its most redeeming features is its massive sonic signature. You are looking at a great bass sound, plenty of mids and sharp trebles. All that in a fully portable package. The 10 hour battery makes it a pretty functional little speaker while voice prompts make using it a breeze. It is a perfect choice for casual outdoor use. Unique Marshall styling and aesthetics you won't find elsewhere. Comes with an impressive complement of drivers. Great battery life which ensures plenty of use per charge. Massive range that ensures good lows as well as trebles. Lacks a protection rating which limits its use outdoors. Marshall is a brand that is best known for their guitar amplifiers. However, recently they have taken interest in other speaker related industries. 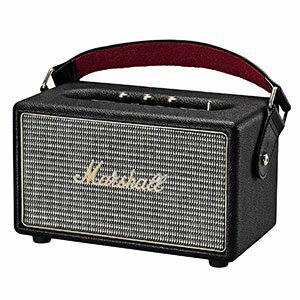 When it comes to Bluetooth speakers, their Marshall Kilburn Portable Bluetooth Speaker gives you an idea of what you can expect from this legendary brand. When you shop for a Marshall speaker, you are getting the performance. With that said, you are also getting the unique aesthetic. Kilburn has a very strong Marshall amp vibe to it, with simple controls and that vintage look. Performance wise it is a great speaker that packs a mean punch. It comes with two tweeters and a massive 4″ full range driver. Combined with a 20 hour battery, it’s quite impressive. Wood front panel gives it a very organic feel. Comes packed with an impressive set of drivers. Generates sound that exceeds most expectations. Good battery life considering its size and output. Lacks a few of the more advanced features. Portable wireless speakers are most often these small devices you can carry just about anywhere. However, there are other designs out there as well. 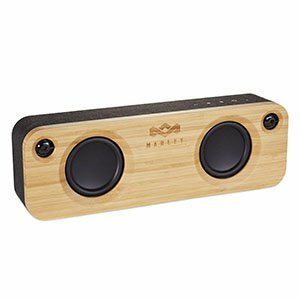 House of Marley Get Together Bluetooth Portable Audio System offers far more than just a compact way to listen to music outside. It’s an actual sound system which delivers a much better performance than most expect. You are looking at a two massive drivers paired with 1″ tweeters and a bass reflex port in the back. That’s the type of driver complement you find in home theater soundbars. With an 8 hour battery, it is a great choice for those who want something substantial for use on the go. With that said, it’s also looks great. A design that is optimal for indoor use. Great set of features which include HD voice mic. Plenty of battery life for a package of this type. Offers high quality audio for both communication and entertainment. Not something you would want to use outside. The next model on our list is quite different from the rest. Jabra is a well known name in the world of audio solutions, but not in the way most would expect. 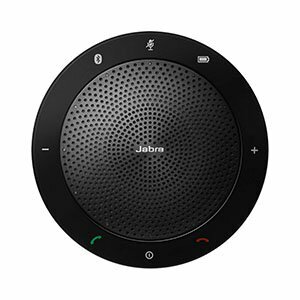 Their main focus is usually on business communication, which is why Jabra 100-43100000-60 SPEAK 510 MS is so interesting. This is a perfect Bluetooth speaker for indoor use. Its circular design, good audio quality and HD Voice features make it an excellent tool for communicating with people while working or relaxing, all while enjoying music with a great deal of quality. The 15 hours of battery life ensure plenty of usage on a daily basis while quick charging make it easy to keep online most of the times. A large driver that delivers good volume and sound quality. Functional design that is optimized for indoor use. Great set of features which make it practical. Ability to pair two speakers for better audio. Battery life of 5 hours is well behind competition. Harman Kardon was always a brand that preferred to do things their way. 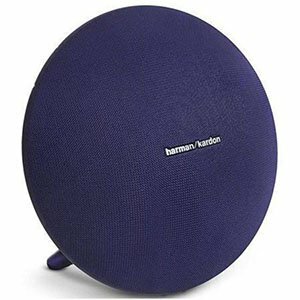 While most wireless speakers are these boxy devices which almost all look very similar, Harman Kardon Onyx Studio 3 brings something completely different. With that said, this speaker isn’t different just to be different. There are merits to this particular design which are well worth looking into. For starters it makes it easier to incorporate a larger driver, which Onyx Studio 3 does. It is no secret that this isn’t something you would want to use outdoors, however it could work in that environment. The battery life comes in at 5 hours of use. You can also pair two of these speakers for a more complete experience. An interesting design that works both inside and outside. Very quick pairing thanks to NFC support. A decent enough battery considering the size and output. Comes with a built in microphone. It lacks more advanced features. Another Bose design we would like to show you goes under the name of Bose SoundLink Color Bluetooth speaker II. 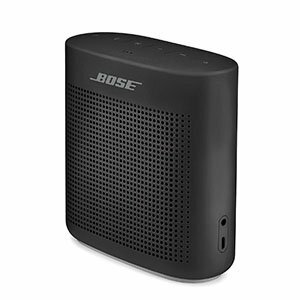 It is a rock solid unit that offers something a bit different compared to the rest of Bose lineup in this price range. This is an upright speaker that is meant for both indoor and outdoor use. Overall, it rocks. The hardware inside makes it a pretty competitive unit, especially considering its ability to deliver 360 degrees audio. Thanks to NFC support, you can pair this bad boy with your smart devices in a matter of seconds. The battery gives you some 8 hours of use per charge, which is alright considering both the size and output of the speaker. A functional design that works both indoor and outdoor. Plenty of power coming from a good selection of speaks. Good battery life for such a powerful setup. Good low end definition thanks to three bass radiators. One of the more interesting designs on the market comes in form of OontZ Angle 3XL ULTRA. This speaker combines several proven solutions in order to achieve what most users really want from their speakers, plenty of bass. The way OontZ has done this is quite simple actually. They have fitted this model with an abundance of passive bass radiators. Along with two main drivers and two custom designed tweeters, you’re getting plenty of output and range from what is still a very compact setup. 24 Watts to be more exact. The battery offers 8 hours of continuous use per charge, which is impressive all things considered. Even though this speaker lacks some more advanced features, the performance is amazing. A proven, reliable design which simply works. Good for both indoor and outdoor use. Features IPX7 protection making it waterproof. Good battery life which allows for plenty of use. Tubular chassis may be a nuisance in certain situations. 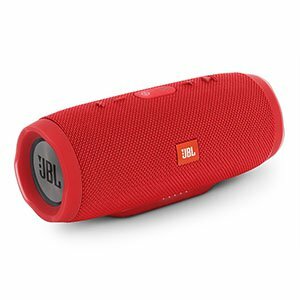 JBL’s wireless speakers are easily among the best on the market. Actually they have been enjoying this title for a while now. One of the more interesting designs comes in form of the JBL Charge 3. This speaker brings you a good combination of performance, functional design and affordable pricing. It is a great choice for active users and hikers. The speaker allows you to pair several devices to it at the same time. The speakers offer a decent amount of power and a surprisingly good audio definition. As for the battery, it can get you up to 20 hours of use depending on how loud you like your music. Overall, it is one of the more reliable options available. What To Expect From A $200 Bluetooth Speaker? A lot of people have this impression that expensive Bluetooth speakers are nothing more than a way for brands to trick users into spending more money. In other words, one of the more shared opinions is that a $50 Bluetooth speaker works every bit as well as one that is four times more expensive. That is not the case at all. High-end speakers, such as the ones on the list above, bring with them a few significant improvements. Features are generally going to be more or less the same as the ones found in the affordable segment. There are plenty of cheap Bluetooth speakers that have a built in microphone, just like the models above. However, we need to talk about performance if we really want to justify the price. High-end Bluetooth speakers will usually feature much larger drivers and more of them as well. This is where you start seeing dedicated tweeters, midrange transducers and passive radiators with bass ports. Larger transducers mean a better handling of the frequency range. On a similar note, the addition of tweeters and passive radiators means that all of the three most basic parts of the frequency range are handled by dedicated speakers. That fact alone does a lot for sound quality. Furthermore, high-end Bluetooth speakers will feature a lot higher power output. Where entry level ones offer some 5-10 Watts, these will get you anywhere from 20 Watts to 60 Watts. Since more power usually equals more volume, the array of possible applications becomes a lot more diverse. With that said, performance is not the only thing that gets better. Design and materials used are also going to be a lot better. High-end speakers usually feature aluminum chassis or even a wooden one. Build quality is great in most cases as well. 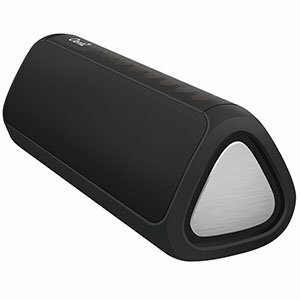 At the end of the day, there are many reasons why investing in a higher-end Bluetooth speaker is a good decision. For those who have strict standards in terms of sound quality, this is a no-brainer decision. Models we have mentioned above are in our opinion some of the best performing as well as best looking ones out there. You’ll probably notice that the brands we went with are well known in the industry. That’s because we did our best to find Bluetooth speakers which have been proven as reliable, saving you from questionable performance as well as sound.